Opposite of create…and does a lookahead using some JS stored within the form HTML to get a list of roles that can be deleted. Before the openidm.delete() function is called, it clears down the members list first. The other attribute is a timer – this is just based on the Activiti Timer element and I’ve set it to take just a time. In reality you would accept a date, but for demo’s a time is much easier. So, after the time has been passed, the initial role to user association is reversed, taking the role away. We then have one workflow left – that is available to any user. Eg it’s a standard end user workflow, and this time for an access request. The use of role-admins leverages the Activiti:Candidate users attribute – eg role-admins could contain 10 users – the approval goes to all 10 and the first one to claim the task can approve. A couple of points on access. The workflow access is governed by the ../conf/process-access.json file. 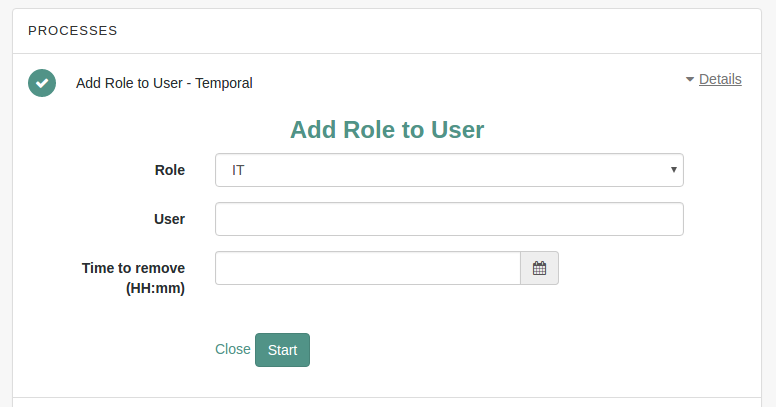 In there add in the pattern of the role _id along with the internal authorization roles that should have access – note internal role and not just managed/role. From what I understand you use something on org/forgerock/commons.. to create a new role in your managed/role repository on the server side (OpenIDM). But please elaborate? I need to understand this code in detail. What is bindValidators? What is #taskDetails form”. Is this jQuery? Or point me to the right literature so that I can learn to understand it. Also, where is “org/forgerock/commons/ui/main/ValidatorsManager”? Is it on the Internet? Or is it on my machine?